Ecotel Narooma is a friendly budget motel offering you a warm welcome and relaxing stay. When we moved to the motel we changed its name to Ecotel Narooma. We took the ECO’from ECOlogical and ECOnomic and the‘TEL’ from motel leaving us with ECOTEL! Since then we have been gradually introducing environmental features to compliment the 6 acre site, it is very much a work in progress. We have rooms to suit individuals, couples, families and groups at affordable prices.We have year round Specials and Package Deals as well as Group Rates so make sure you leave us your email address and we will keep you informed via our newsletter.All rooms have expansive views from large picture windows. Rooms include linen and towels; ensuite with shower; kitchenette equipped with kettle, toaster, crockery, cutlery and glasses; bar fridge; heater, fan; TV and WiFi. Microwaves or hotplate and pans are available on request. Some rooms have the option of additional fold-down beds or travel cots. All rooms are NON-smoking. However smoking outside with sensitivity to other guests is OK. 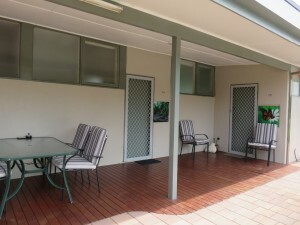 Shared north-facing verandas provide a sheltered spot to relax overlooking the lawn and BBQ area. We have ample parking for boats, trucks, caravans as well as cars. 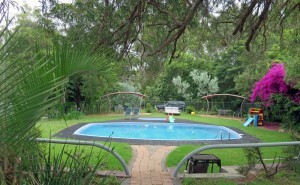 Enjoy the seasonal swimming pool nestled in a landscaped glade with undercover picnic tables. 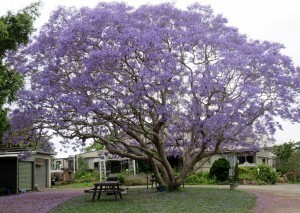 Use the BBQ and picnic tables under our magnificent Jacaranda tree. Get to know our hens,feed them your food scraps.Take some fresh Ecotel free-range eggs home with you or eat whilst you are here.  Find out more about our ECO practices. Where ever possible we use local produce so for tea andcoffee we will supply local milk from either the Bodalla or Tilba dairy. The soap in your room is locally made goat’s milk soap. (if you would like to take some home we sell it in Reception.) Lemon in your tea? Pick your own from our lemon trees. 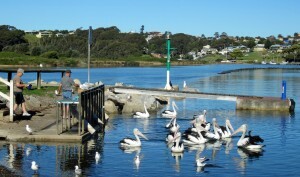 Best of all from our back gate it is about an 8 minute walk to the famous Narooma Boardwalk (ideal for spotting fish, octopus, stingray, sea birds, hand-line fishing, watching the sunset). A left turn takes you to Apex Park (childrens’ playground and BBQ facilities), public boat ramp and fish cleaning area, a safe netted swimming area and sandy beach or access to North Bar surf beach. A right turn takes you along the inlet and into town. For those of you with boats there is ample parking and easy access through our property to and from the Apex Park boat ramp without going onto the highway. Enquire about monthly boat storage and make the most of summer fishing. 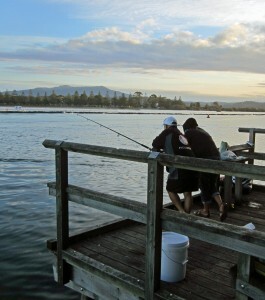 Local seafood is a specialty in Narooma: oysters, prawns and a variety of fish can be found at many of the town’s ‘eating-out’ or take-away options.The two clubs in town offer a courtesy pickup and drop off bus service. In Reception we have plenty of information on your eating options. For self-caterers there is a fresh seafood seller on your left just before you cross the Inlet bridge (great prawns and oysters). On far side of the bridge is an IGA, fishmongers and butchers. There is a Woolworths to be found further through the town on your left, just keep following the Princes Highway.